Benefits of Dark Chocolate: Health up Your Easter Baskets! Avoiding sugary treats altogether at holiday time is a tough bar to meet. The benefits of dark chocolate abound, especially when it comes to reducing added sugars in your Easter baskets! The Easter bunny is coming and he's hopping along with baskets full of sweet treats. As a parent trying to get your whole family eating healthy, that candy bonanza can be tough to navigate. One candy bar can put your child well over the proposed WHO guidelines for added sugars. And it's those added sugars that are creating the massive obesity epidemic in this country, as Laurie David's riveting new documentary, Fed Up, exposes. Avoiding sugary treats altogether at holiday time is a tough bar to meet. That's where the benefits of dark chocolate come into play. Dark chocolate has been linked to improved heart health. A recent study published in Scientific American suggested that dark chocolate may also benefit the microbes in our guts. Beyond those important health benefits, offering dark chocolate as an alternative is an easy way to help reduce added sugars in your family's diet--dark chocolate has a fraction of the added sugars that milk chocolate contains. 1) Stick to chocolate with at least 70 percent cacao content. 2) Enjoy, but in small portions. 3) Limit sweet treats to the weekends only. Fruit on weeknights. 4) Make your treats at home. Our dark chocolate bark recipe is a delicious treat for the whole family. Bonus, it's great fun to make with your kids -- the recipe is easy and the rewards are high. Make a big batch and package it up in cello bags with raffia ribbons. Tuck your homemade dark chocolate treats in your baskets, and save a few to give as teacher thank you gifts. 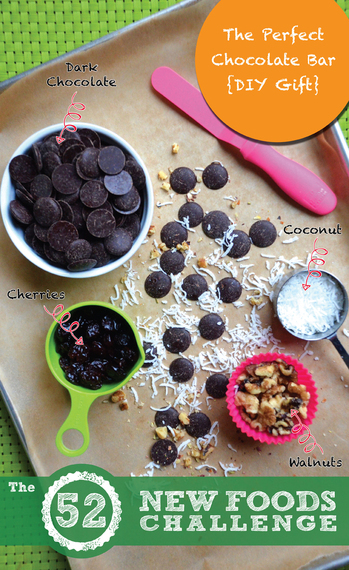 It's a wonderful way to enjoy the benefits of dark chocolate, along with the benefits of cooking together as a family. Double bonus. Jennifer Tyler Lee is author of The 52 New Foods Challenge (Penguin Random House/Avery 2014) and the creator of the award-winning healthy eating game, Crunch a Color®. Her family cooking adventures have been featured at Jamie Oliver's Food Revolution, Rachael Ray's Yum-O!, Laurie David's Family Dinner, Pottery Barn Kids, and Whole Foods Markets. 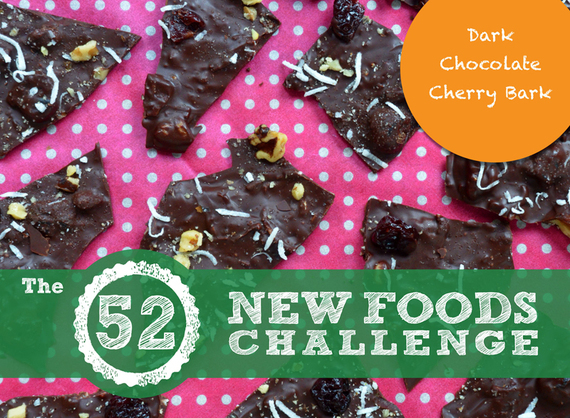 Her book, The 52 New Foods Challenge, releases November 2014.